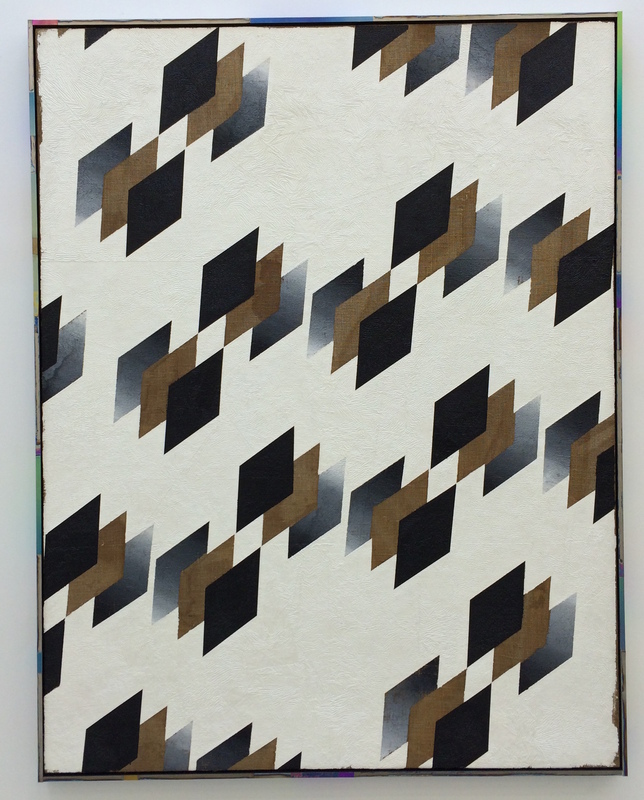 The exhibition titled “Black Hole” at Marlborough Chelsea is a solo show of new work by Mark Hagen. In the back gallery there is a series of paintings based on rhombi. A rhombus is a equilateral quadrilateral, a four sided figure where all sides have the same length. 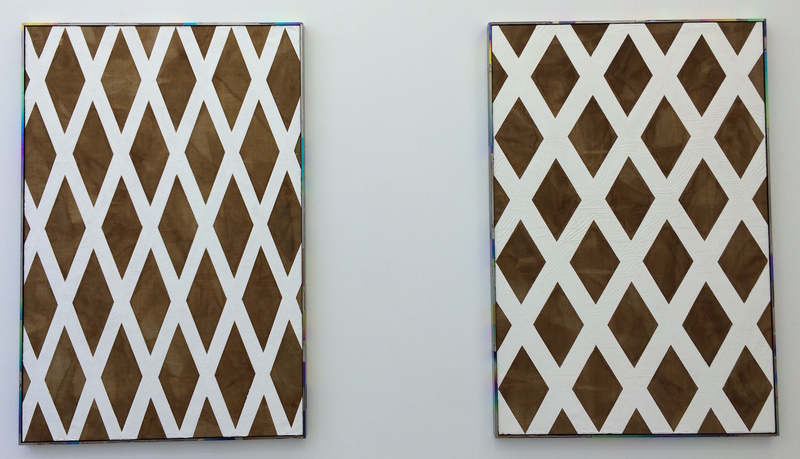 In these paintings the rhombi are diamond-shaped, similar to the shape found in wire fencing. This first work features a series of scattered rhombic triples, created by shifting and overlapping the rhombi along the shorter of the two diagonals. It is important to know that these are not your typical hard edge paintings. Hagen masks off his shapes using tape and plastic then paint is poured through sun-exposed burlap. His unique process creates a more textural quality. Left “To Be Titled” (Screen Painting #8), 2016 acrylic through burlap, artist frame(titanium anodized with diet coke). Right “To Be Titled” (Screen Painting #1), 2016. These next two paintings are non-square grids. By changing the thickness of the number of lines between the two works the artist presents various examples of the diamond pattern theme. By limiting his geometric vocabulary to one type of shape in this series of work, Hagen has created a visual dialog of comparison. Pictures courtesy of the gallery and the artists.